This 300 large piece jigsaw puzzle is designed by Alan Giana and measures 46 cm x 61 cm. A comfortable house sits alongside of riverside. The house is surrounded by colourful flowers. Available in three piece count. 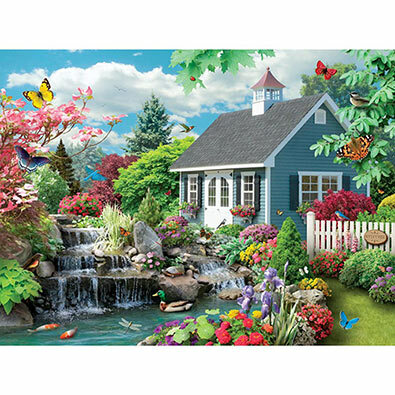 This 300 large piece jigsaw puzzle is designed by Alan Giana and measures 46 cm x 61 cm. Spring is in bloom! A light house shines over a river surrounded by flowers. Available in three piece count. This 300 large piece jigsaw is designed by Alan Giana and measures 46 cm x 61 cm. Woodland creatures gather around a cabin in a snowy forest. Available in three piece count.